A Glimpse of the Climate Future? It was time for the yearly drive down to the Bay Area in California to visit my family, and we made a few alarming observations. 1. Lake Shasta was as low as I've ever seen it in my life! An article written in May noted a 90-foot drop in the water level, and I can just add that June, July, and half of August have done nothing to improve matters. In fact, if I'd seen the water at the level pictured in the May article, it wouldn't have freaked me out as much. Let's just say that if a drought like this ever hit Loch Ness, Nessie would have to evolve into a land animal. 2. California was importing cherries from Washington State! What the heck? My mom brought out a bag of Bing cherries from glorious Washington. Back when I was growing up, you could visit Bing cherry farms in San Jose, and now the cherries had to come from Washington? Drought drought drought. The tan-colored bars are bad news. I remember those wet years in the 80s, and they were no picnic either, but mostly because drizzle depresses Californians even more than Washingtonians because they've developed neither tolerance nor secret love for it. 1. 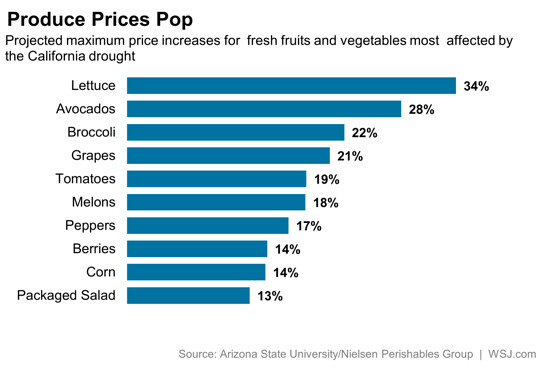 Food prices will continue to climb. Our wallets have taken a hit these past couple years, and it's going to get worse. Even if you're a farmers-marketgoer, buying local as much as possible--if the rest of the country starts buying up Washington-grown foods, that means higher prices for all of us. It's relative of course. I think, no matter where you live in the country, people are going to have to get creative about getting and retaining water, but at least the PNW still gets plenty in Western Washington (take the crazy showers of the past day)--we just have to get creative about capturing all that wetness. In any case, be sure to load up on our in-demand fruits and vegetables and farm goods at the Market this Thursday and Saturday, before the rest of the country cottons on to how spoiled we are! And I leave you with a picture of much water, to relieve your mind. This is Crater Lake. Granted, it took thousands of years of snowfall and rainfall for the lake to reach its present depth (and last year they only received half of normal snowfall), but doesn't it do your heart good to see it? It was clean enough to drink, and we drank it!